More than 60 percent of the human body is water, which can make staying hydrated while running an exhausting challenge. Everyone intakes and expels water differently so there is no magic formula to stay out of the danger zone. However, hydrating early and often and monitoring urine color tend to be the biggest keys to a successful run. Start by monitoring your urine color, especially right before a long training run. A light, lemonade yellow is what you ought to be aiming to see before a run. It may take time before you can comfortably intake water regularly to be prepared for a long run. During the training phase, stay hydrated throughout the day by carrying a water bottle wherever you go. The last thing you want to be doing is chugging water right before a run. By maintaining water levels throughout the day, you will feel comfortable when it comes time to run no matter what time of the day. Keep a bottle on your desk and in the car so there is never an excuse to substitute a soda if you get thirsty on the go. Once you have mastered the art of hydrating before the run, it is time to figure out how the stay hydrated during the run. Weather conditions, how efficiently you sweat, and the intensity of your run contribute to how much water you require. Use the urine test after (or during) your run to determine your hydration needs. Short runs of 30 minutes or less in cool conditions may need just an extra glass or two post-run. 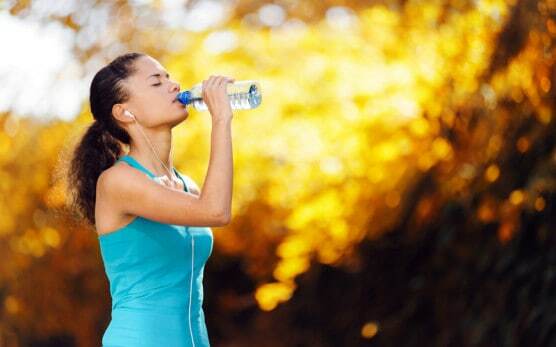 Longer runs of over an hour in hot weather will require hydrating during the run. There are many options for consuming water during the run, but it is important to keep race day conditions in mind when training. Research the water stations on the course map if you are not planning on carrying your own water on race day. On the last few training runs, drop a few bottles of water along your route at the same mile markers as the race. If you do plan to use a handheld bottle or a fuel belt during the race, practice, practice, practice! Utilizing sports drinks is a personal decision. Some runners find an extra edge in the extra calories and electrolytes, while others eschew anything other than water during the race. Other runners only drink water on race day and save the sports drinks for recovery. Steve, from Huntington, West Virginia, finished his first half marathon earlier this year. He used Gatorade to recover both after his training runs and the race, but drank only water while running. When race day comes, remember to take the weather and your previous training runs into account. Slow down at the water stations to ensure you intake an adequate amount of water. Cup sizes and pours vary widely so you may need more than one cup to stay hydrated. If it is particularly hot, pour the cup of water over your head and neck to keep your body temperature lower. Do not forget to make sure some goes into your mouth as well! Finally, respect the signs of heat-related illnesses and dehydration. Extreme fatigue, dizziness, confusion, light-headed-ness, nausea, and muscle cramps are all signs that your body is too warm. Take caution and respect your body’s capabilities. Better to cross the finish line with slower time than to not cross it at all.